The Maths Lab – This is a student study area in the same building as our lecturers. It is equipped with many boards and a data projector for practising presentations. Clickers – These interactive devices are used for in-class voting and give staff and students anonymous feedback about student progress in modules. SUM:UP – SUM:UP is a mathematics and statistics drop-in area in the library. It is staffed from 10am–4pm on weekdays during term. The library is itself open 24/7 all year long. IT facilities – Students also have access to a range of modern computing facilities which include PC-equipped tutorial rooms and PC- and Mac-equipped open access labs, as well as WiFi access and license support for your devices. All machines have MS Office as standard. 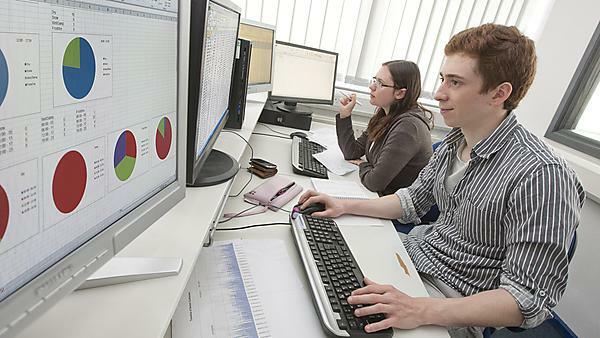 Scientific software – Students gain expertise with a range of professional mathematical software. This includes the Python programming language, systems for symbolic manipulation and visualisation (Maple), as well as statistical computing and data analysis (R and Excel). High Performance Computing for project work – For project students we can offer access to High Performance Computing, and, for interested advanced students we support the use of modern scientific programming languages (Python, C, C++, R, Fortran and Open MPI). Students also have access to our GPU research centre for massively parallel processing.